DAVIS — Assemblymember Mariko Yamada (D-Davis) remembered Thong Hy Huynh on May 4, the 30th anniversary of his death in a racially motivated attack at Davis High School in 1983. The atmosphere at Davis High has changed over the years; Yamada’s daughters graduated from the school in 2003 and 2004, and have “mostly positive memories,” she said. Students at DHS observed a moment of silence — an annual memorial aimed at ending bullying and discrimination. “If everyone makes a conscious effort to not judge anyone else on trivial things like race, gender, sexual orientation, etc., that will make a difference,” Isabelle Chen of the Climate Committee, which works to promote tolerance at the school, told The Hub, the campus newspaper. 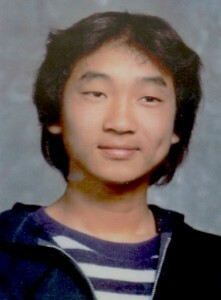 Huynh, 17, was born in Vietnam in 1965 and immigrated with his family to California by way of Taiwan. According to The Davis Enterprise, there had been friction between a small group of white students and a small group of Vietnamese students prior to a confrontation on campus between Huynh and Jay Pierman, 16. Pierman used a long knife to stab Huynh in the torso, causing him to die within minutes. Pierman was charged with murder but was convicted of voluntary manslaughter and sentenced to six years in the California Youth Authority. Huynh’s family and friends said the punishment was much too lenient. A memorial plaque marks the spot in the school courtyard where Huynh died. The Thong H. Huynh Awards are presented annually by the Davis Human Relations Commission. Established in 1983, the commission is charged with developing positive human relations through greater education and understanding, and encouraging and promoting equal opportunity under the law. The awards honor individuals and organizations that have made significant contributions in addressing or improving civil and human rights issues in the community. The first award was given in 1986. The perpetual plaque hangs in the lobby of the Community Chambers next to City Hall. 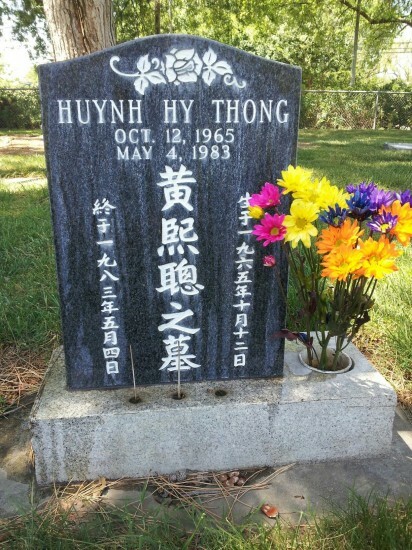 Thong Hy Huynh is buried at Davis Cemetery.